I received the first three books in this seven books series from my husband last Christmas because it was recommended in 1001 Children’s Books You Must Read Before You Grow Up. I wanted to finish the series by the end of the year and I did. Instead of reviewing each book individually, I thought I would review the series as a whole. As I was trying to summarize, I actually foudn the best short summary is on Wikepedia. Each day is another book and another Trustee that Arthur must fight. Luckily, he is not alone, he has friends that he meets in the first book that are with him all along. This is a great MG-YA series for boys. Arthur is a very unlikely hero, but it helps make him a very likeable guy. You can’t help but cheer for Aurthur in all his quests – and there are a lot. In order to defeat the Trustees, he must collect the Will of the Architect (the creator of the universe) and gain the keys. If he doesn’t the entire universe will be reduced to Nothing. The characters shine in this series. It is great to watch Arthur’s transformation from boy who is about to die from an asthma attack to a hero who is trying to save the world. He has many internal struggles over the right thing to do, which really made me think. The Trustees were all very difficult foes, as they represent the seven deadly sins, but with a fantasy twist. To represent Lust, Lady Friday takes human experiences to enjoy at her own pleasure. Drowned Wednesday eats so much that she becomes a whale. The overall story is also very well-done. Nix knows how to write to his audience, both in his style and his pacing. I thought the ending was very clever and I did not expect exactly what happened. I had a slight guess at the result of the keys coming together, but I was not 100% correct. The first couple books in the series were complete stories, but after Wednesday, the stories didn’t really end which I found frustrating. Books need to be able to stand on their own. I am glad that I read them after they were all published, or it would have annoyed me even more. Some of the characters could have been much better developed and I wish they books could have been longer to make that happen. I understand why, I just thought it was dixsappointing. I would have to recommend this book and strongly recommend it to male, fantasy lovers ages 9-15. Have you read the series? What did you like or dislike about it? Do you know someone who might like it? Let me know in the comments! Thanks everyone for entering! There are 6 winners! They have 48 hours to respond. My husband and I saw Tangled this weekend in 2D and we LOVED it. We are huge Disney fans, so the instant we saw there was going to be another Disney musical over a year ago, we knew we would have to check it out. It did not disappoint. The story is based on Rapunzel…but just based on it. There were quite a few differences that I don’t want to go into because I don’t want to spoil anything. I just want to review some of my favorite parts of the movie. The music in this is great and makes me think of the music from the movies in the 90s, probably because it was done by the uber-talented Alan Menken who also wrote the music for The Little Mermaid, Beauty and the Beast, Aladdin and Hunchback, just to name a few! The songs fit the story, we really well performed (who knew Zachary Levi aka Chuck could sing?) and there was one that could become a Disney classic! My husband said something along the lines of “A Disney movie is only as good as its villain”. I tend to agree with him, and the villain in this is perfect. She is sarcastic, manipulative, greedy, and a little scary (but not too much for kids). You understand her motivations for everything she does. Her song “Mother Knows Best” sent a chill down my spine! It wasn’t hand-drawn, but that is okay for this movie. The computer animation was up there with the Pixar films. In the previews, there was a computer animated movie with some of the worst animation I have seen. 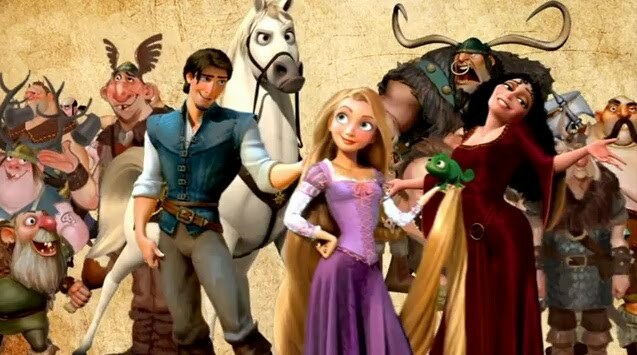 Luckily, Tangled has some of the best. We will go back and see it in 3D in a week or two. The characters were so well done. I really understood all of them and thought they were well-developed. Rapunzel was spunky and a little shy, but ultimately was a strong young woman who cared about more than the cute guy she was traveling with. She is a great addition to the Disney Princesses. Rider/Eugene was also a really well-developed character. He is like Aladdin in many respects, but was also an individual. The other characters were great too – the horse, the chameleon, and the bad guys with fun dreams were awesome as well! If you like Disney at all, make sure you go see this fantastic movie! So the weekend is over and I did not do as well and I wanted to. Yes, I read for eight hours and only read one book. For me, that is pitiful. The book was not a quick read at all and was at times very difficult because all of the different story lines. I liked it and will do a review later, but felt that some of it was not necessary and it took me until 250 pages of the 400+ page book to figure out what wasn’t really part of the story. Even though I failed most of my goals, I am really glad that I was able to read that book – I find out when I finished it that it is also in the 1001 Books You Must Read Before You Die! I also didn’t read at all on Sunday. Probably because I was just tired of reading and wanted to watch some of the DVR (Taylor Swift’s special was adorable!). I also saw Tangled (so cute, will review later this week), and baked two batches of cookies this weekend. I didn’t know sugar cookies were so difficult! It was a great weekend for reading and I am so glad that I participating in this event, even if I didn’t do so well! I hope i can do better next year! I only read for 3.5 hours yesterday, so I am a little behind my pace. But we went over to see some friends unexpectedly, so it is okay! I am still reading my book club book. It is good, it is just a really long read. I am only on 179. Usually I would have finished a book in four hours. The book has some flaws, but I am glad we are reading it! Have a couple of errands to do today, and my head is hurting, so I may have to skip out on a jewelry party. I think it would be better if I just took medicine and relaxed. I am hoping I can get in more reading and finish this book! How is your weekend going? Are you enjoying it? It feels like it is Monday and I should be back at work, but it is only Saturday! Four day weekends rock! I hope everyone had a wonderful Thanksgiving! We went to a friend’s house and had a wonderful meal followed by some game playing. I missed our families, but it felt like Thanksgiving and it was great! I am about to sit dow and read my book club book for a little bit. I have a feeling I will be reading throughout the weekend for an hour or so instead of big chunks because I want to enjoy time with Jason. I know we are heading to lunch today (love being able to go out on a weekday, it is so much cheaper!) and w want to go see Tangled at some point. We also plan on catching up on the DVR and playing some video games. It should be a nice, relaxing, and relatively inexpensive weekend. We aren’t doing any shopping – most of our shopping for each other is done and we finished shopping for his family who we celebrate Chanukah with. We will wait for mine. We are heading to Borders to get some coffee after lunch since they have a coupons for a free coffee or latte! If you have a Borders card, check your email again to make sure you use your coupon! Well I am off to read for an hour then I plan to check out other participants posts before lunch! Happy reading! Last night’s episode of Glee was great. The story and the performances were phenomenal. Even better was what it told teenagers – those who are gay and those who aren’t. I love the It Gets Better Project, but I thought that Glee did a better job of giving kids a message that they can use now. Yes, it DOES get better and people have shared amazing stories through that, but you can also make it better yourself. There are adults who care about you an want to help you. Kurt was lucky because Mr Shue looks out for the Glee kids and saw him in distress. Teachers can’t always see what is going on with all of their students, but they do care. Sue was a great example. She is a bully herself, but when she realized that Kurt was scared to be in school she got serious and did everything possible to make it a better place for him. Even Sue. Find a teacher, a counselor or a principal that can help you. Find an adult in the school who can look out for you and help, even if you just need an adult to listen. I know not everyone has a completely supportive family, but families can surprise you. If you feel scared at school or if you are bullied, make sure you tell your parents. If you aren’t ready to come out to them, it is okay, you don’t have to, but they should know. They may be able to do something. You need to make them realize it isn’t harmlesss teasing. If you can’t talk to them, find someone – an aunt or uncle, older sibling, anyone. To make real change, you need some adults on your side who are willing to talk to administrative like Kurt’s dad does. You do not need to change who you are. You did not choose this and it isn’t something that needs to be fixed. You are who you are and you should be proud of who you are. You have friends that love you and want you to be happy. They love you just the way you are. You are SO amazing. Try not to forget that. If you have done everything you can and nothing has changed, find something else. Not everyone can afford a private school, but most schools take open enrollment. There are districts with stricter policies or that are more welcoming. Some private schools may have scholarships or grants especially for kids trying to get away from a hostile environment. Leaving does NOT mean the bully has won as some people might tell you. It is about YOU. If you are somewhere you are comfortable and unafraid, you will grow and excel in ways you probably can’t even fathom. Take care of yourself. Why don’t PUBLIC schools have a zero-tolerance bullying policy? It is messed up. Why is it just okay for kids to get picked on for being different? It is because most of the schools are run by parents, but most of the parents who speak up are bullies themselves. It doesn’t have to be that way. All parents can stand up to make their school change. Mose likely, your kid or some of their friends who you know well, are bullied. Some maybe as badly as Kurt was. They don’t have a real voice in the schools though, you do. So call and ask why there isn’t a zero-tolerance policy. Go to a school bo9ard meeting and suggest it. Find other parents that want to see the change. It will help everyone. I know it is a very last minute sign-up, but I have decided to participate in the Thankfully Reading Weekend! 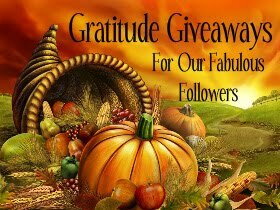 This lovely idea is hosted by Jen from Devourer of Books as an excuse to do an obscene amount of reading over the long Thanksgiving weekend. There aren’t any rules, it is just to try to get some reading done, finish challenges, etc. There will be mini-challenges which I hope to participate in. Since there aren’t any real rules, I am going to set some goals for myself. 2. Finish Feast of the Goat by Mario Vargas Llosa for my book club and jot down some discussion ideas. 5. Finish Jane Eyre since I have been on a 3 month break. Those seem pretty reasonable goals! If you want to join (and you really should!) head over to the sign-up post! After adding up extra entries there were 14 entries in this giveaway. Joli has been emailed and has 72 hours to respond! To see what this series is all about, check out the introduction post. Marketing is an interesting part of the publishing world. When people think of book marketing, they tend to think of the big books, the books by Patterson or Grisham that actually get very large budgets. Yet all books need some level or marketing, even those that have a very small budget. Figuring out marketing plans for the mid level books is a challenge and requires creativity, which is why I am interesting in the area. The marketing departments are responsible for figuring out how to spend the money – should it be on placement in stores (it costs money to get the book in the front, on a table, or even face out), should it go towards ad online, in magazines, or somewhere else; or should it just go towards advanced readers copies (ARCs)? The ARCs are usually distributed by publicity, by the budget for them can come from publicity or marketing (or both), it depends on the publishing house and its structure. Being part of the marketing team also means you really need to know the market. What does the group watch on TV? Where do they go online? How can you target the people who will love the books in the best possible way? If you can’t figure that out, you probably won’t sell many copies. They also have to design the marketing pieces and know what will appeal to the audience. Oh and those great (or terrible) covers? Marketing has a big say in that also. And don’t forget about having to market eBooks now too (but people think they should cost much less than regular books even though they require more marketing money). Marketing is all about achieving a balance between so many factors. I think marketing is an incredibly important aspect of publishing and that publishers need to figure out marketing in the digital age, and what can be turned into publicity instead. I would be great at helping figure out how to do that. I also see how ads are only useful with certain demographics and certain books. I can formulate plans that make the least amount of money go the furthest, which is really the whole goal. I also understand what people want out of their book covers. They are sick of the same thing on every cover and want a cover that is appealing. They also DON’T want any white washing…so I would be able to help them pick out covers that keep this from happening. Readers are diverse and want their covers diverse also. I think I would really be able to help move marketing into the current times and would love the opportunity. What do you think of what publishers are doing now with marketing? Do you see flaws or have you seen something lately that you love? Let me know in the comments!